Ric Szabo has served in various capacities for fisheries, wildlife, and environmental agencies all his life, and his interest in prehistory extends from a long fascination with the natural world. Short stories of his have been published in Wet Ink and Page 17. The Walk of the Wandering Man is his first novel. 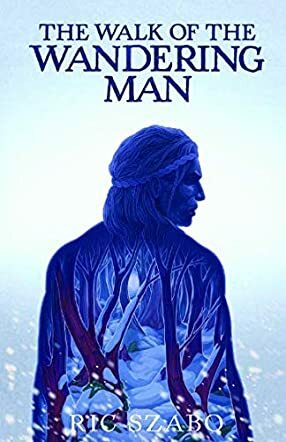 The Walk of the Wandering Man by Ric Szabo is an epic story of humanity that starts 5000 years ago in the harsh environment of Central Europe. The story begins with the intertwining of the fates of a young boy called Konli and a young man, Vratu, a Mesolithic hunter, brought together by tragedy. When Vratu is sent on his rite of passage, to walk with the Earth Spirit, he has no idea what the gods have in store for him, and how his quest will bring him manhood, pain, suffering, joy, and ultimately love. He knows treachery and killing, finds his conscience and learns compassion, and discovers a moral certainty to do what is right. Who is the mysterious boy with the strange tattoo and the intriguing necklace? Why has Vratu been chosen to protect him? Fans of Jean Auel’s Clan of the Cave Bear series will absolutely love this book. The plot is complex in that it encompasses the lives and deeds of a number of characters and their clans. The reader embarks on a journey with Vratu that informs as it entertains. The age of the hunter-gatherer was ending as the farmers began to assert their right to land. Clashes and killings, and some degree of xenophobia were inevitable as the fight over resources raged. Alliances are formed, then broken, then remade in an intricate story line. The reader who enjoys prehistory and its detail will be impressed, as I was, at the meticulous research done to bring the epoch to life. The author writes in a lyrical style that is appropriate for the genre, slightly archaic but most pleasing to read. A modern author voice would not have worked, and Szabo gets it just right. I enjoyed the descriptions which are vivid and immersive; indeed, readers find themselves thrust right into the action, be it fighting to survive the elements or in the midst of battle. The story takes the reader back in time most amazingly. One wonders how early man managed to survive, how they learned to create tools, to make clothing, shelter, medicines, all the things that the modern reader wouldn’t give a second thought. Social constructs and mores, traditions, customs, and laws are explained by seamlessly integrating them into the plot. The themes of spirituality and worship, and the place of nature in an emerging society’s ethos are clear. The story unfolds at a leisurely pace, although the prologue starts with action and mystery, and death. This is an epic adventure and one that belongs not only to Vratu, but to the communities he encounters and the people he calls his friends and companions. A thought-provoking, instructive, and extremely enjoyable read. The Walk of the Wandering Man by Ric Szabo takes the reader far back in time to 5000 BC in Central Europe. Farmers are making themselves known across the continent from the east, and hunting and gathering has come to an end. A young Mesolithic hunter is about to have the gods show him that his rite of passage will be different than any of those who have gone before him. Through the wilderness that is oftentimes brutal he will find a different people. Follow his journey that is beautiful and full of horror and many other emotions. It has been a while since I have read a book that happened this far back in human history and I was really looking forward to this read, and it did not disappoint. This story drew me in right away and the more I read, the more invested I became in the characters and the events. The emotional aspect of this book really made me feel connected almost instantly. It is not often you read a book that has genocide and also just such an evolution in it, but you get that and so much more from The Walk of the Wandering Man. Author Ric Szabo really has a good hand when it comes to pacing and making you feel connected to what is happening on the pages. The plot has great action as well and, overall, it is an enjoyable read. If you don't mind emotions while reading (which I enjoy), it really makes this book a perfect story. I recommend you grab it and curl up for a great read. The Walk of the Wandering Man by Ric Szabo is set against the backdrop of Central Europe in 5000 B.C. Vratu of the clan of Banan is a fine hunter and arrives home with his kill after hunting. His time to walk with the Earth Spirit comes and no one says a word when he leaves the camp. His destination is a little over a two-day walk and Vratu knows the land intimately because he has hunted there many times. His mind is set on being gone for a full lunar cycle. Vratu knows the Walk is going to be a test of his mind and muscle. The rules are simple; he cannot seek assistance and he has to be gone for a respectable period of time. He has to follow the conditions and if he fails, he will have to redo it, delaying his transition into adulthood and taking a wife. The story takes a turn when Vratu’s journey leads him to distant lands where he discovers his true purpose in life. It is a story of coming of age, compassion, love, horror, and genocide, and the detailed and descriptive narration brings the characters alive and makes the scenes vivid. The imagery is exquisite and the author enhances it with his clever wordplay. I liked the element of shamanism that runs through the plot. Since it is set in primitive times, there is a sort of rawness and crudeness in the behaviors of the characters depicted. It is interesting to have a look at the Central Europe that existed during those prehistoric times. The storytelling is exceptional and each scene segues into the next one effortlessly. There is a bit of violence that is demanding of the plot and the era it has been set in. There are many characters in the story and I like the way the author has knitted them around Vratu seamlessly and without sounding forced. There is a lot of action happening hence there is not a dull moment in the story till it ends. The character of Vratu has been portrayed in a way that he dominates the plot till the end, whether he is there in the frame or not. A story for fans of ancient history and those who wonder about early man.